Recently a thoughtful friend baked me a savory treat as a thank you gift—something I’d never heard of or tried before. Called Banica (pronounced Ba*ni*tsa), it is a traditional urban pastry in Bulgaria and the Balkans in general, with slight variations here and there. The word is often used to mean crumpled or badly maintained. The one she made me was prepared using filo, Bulgarian feta cheese, eggs and yogurt and looked a little like rope made of bread wrapped into a tight circle. In Bulgaria it is also often eaten with more extra cold yogurt on the side and a fermented beverage called boza. After re-heating it in the oven for 15 minutes, I served it as an appetizer with dinner and it was a hit. The savoury flavour of the soft feta was lifted by the yogurt inside and the crispy filo pastry gave it a good crunch. No wonder they eat so much of this! It’s delicious. I only wish I had some Bulgarian yogurt and boza to accompany it. Spread a package of thin filo sheets on the table. make sure they lay flat and are defrosted to room temperature. In addition, you may add spices to your taste, such as pepper or oregano. In a small bowl melt some butter and prepare a brush beside it. Prepare a round pan to the size you desire. Grease and line the pan a thin layer of oil and flour. Assuming the filo you have is thin, it is recommended to use two to three sheets per roll. By lifting half a sheet at a time, drip with the brush a few drops of butter in between the sheets you are going to use for the first roll. This way when baked, the filo sheets stay separated and crisp. Do the same for the top sheet too on which you will put the filling. With a spoon, spread a row of the mix just inside the outer edge of the filo sheet. Next, gently lift and roll the first roll from one edge to the other – being careful not to press so the filo stays crisp and airy. Place the first roll in the pans outer edge. Repeat this process and complete the spiral in the pan from the outer edge to the centre. Brush the Banica spiral with more butter, and bake for 20 minutes, or until the crust becomes golden from the top and bottom. Best to eat when still hot. Briouats: Moroccan Pastries with Chicken, Eggs and Preserved Lemons /New York Steak with Horseradish Asiago Crust /Stuff It! In Bosnia & Croatia they have something similar called a Burek – you get them at a Burekdžnica. The Bureks in Croatia were tasty, but everyone kept telling me that the tastiest ones were from Bosnia. Sure enough, the ones I had there were a little piece of heaven. It turns out that the Burek originated in Bosnia and was imported to Croatia by Bosnian Croats – so it makes sense that the best ones came from the source. The most delicious burek I had in the Balkans was in Mostar, a small town North of Sarajevo. The burekdžnica was small and didn’t really have a storefront – it seemed like they were mainly taking orders by phone and then delivering them all around town. There was a giant wood fire – the bureks were cooked on a metal tray underneath a big metal dome. Coals and ash from the wood fire were piled on top of the dome to make a small enclosed metal oven. I sat by the river and ate two bureks for breakfast; it was one of my favourite moments from my time in the Balkans. Thanks for the post, Mark! Oh Yes Please…this looks great, I can almost taste it! 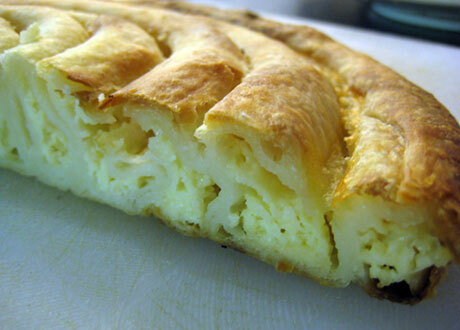 Although burek is somewhat similar to banica (or gibanica, in Serbian), there is a difference in the type of cheese used, as well as in amount of oil used to bake the meal. Burek is much greasier, and the cheese is more sour. Both meals are great if you ask me, Balkan cuisine is truly wonderful, but yet undiscovered by Western cultures I would say. Good to hear you have had some great time with banica! Greetings from Serbia, and the Balkans. From what I understand, “börek” in Turkey covers a wide array of items made with yufka pastry (similar to phyllo). Incidentally, we just made a Turkish börek with beef filling ourselves, shaped into a spiral like yours! Heyy I’m from Bulgaria!! And yes, we do eat this A LOT and it’s delicious! I think it’s much better than burek! I don’t like to drink boza but many say it is the perfect addition to the banica.. my grandmother makes it all the time and she always says that the more white cheese and eggs you put in it – the better! And her banica is the best one I’ve had and I’ve had MANY! Im from Bulgaria too!!! !I love Banitsa!It’s my favourite food!!! There is something that I ought to point out – Feta cheese is Greek cheese, and while similar to Sirene, it isn’t the cheese used to prepare Banitsa. Feta and filo sheets are merely replacements for sirene and handmade banitsa sheets and until you’ve tried banitsa made with the latter, you will have no idea how awesome this pastry is. I am from India and have some very close friends from Bulgaria. I LOVE Banica!!! its yummy! There is no question that handmade banitsa/borek/gibanitsa/yufkadough is better than store-bought phylo. However, most of us who live in the West have little choice; ergo, phyllo dough. For sungle sheets, a common brand is Athena that comes precut for 9×13 pans. For puff pastry sheets, Pepperidghe Farms is not too bad. BTW, while the latyter is easier, I have found that the former makes a supeior product as the filling is not just one glob between the two thicker pastry layers. In any recipe that calls for Feta, you will always improve the flavor by using Bulgarian feta or sirene (white cheese). That is as true for salads as it is for banitsa. (True story: Years ago, I was in Astoria, NY and went to a Greek store that had at least six varieties of feta. The Bulgarian feta was the most expensive and, as it turned out, the most popular). In my part of the United States, an available brand is Vigo and you should talk to your local grocer about offering it. Az I cialito mi semeistvo obichame Banica, notuk niama boza I iadem banica sas airian,Pravia vkusna banica s gotovi kori, no nee vkusna kato banicata na babami.